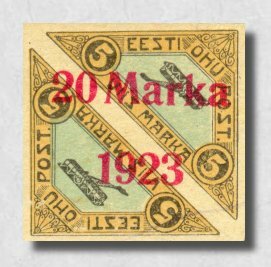 The surcharged air mail provisionals of 1923 (Mi #41-45) were issued 1 October to cover supplementary postage for mail carried by the air lines Tallinn-Helsinki and Tallinn-Riga-Koenigsberg. In other words, these issues were used for regular air mail, NOT for the Ice-flights. Remainders of air stamp 1 (Mi #14) were overprinted for this use. occur alone on covers! Genuinely flown covers with correct postage are very very scarce. 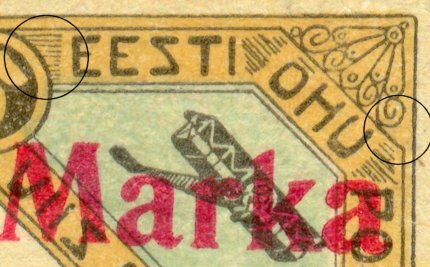 Original issues have 10 straight lines with even distances and even right edge between "EESTI" and "OHU", while the lines on forgeries have uneven distances and uneven right edge. 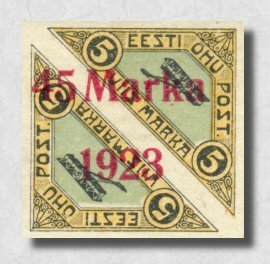 Original issues have 10 straight lines to the right of "EESTI", but only 9 lines to the left. Most (but not all!) forgeries have 10 lines on both sides. Go to the next gallery to see more details about the different plate types of these forgeries! Go to this gallery to see samples of genuine and fake air mail covers!